RSN Handbook of Embroidery – Winner Announced! So, who won the Royal School of Needlework Handbook of Embroidery?! Last week, I reviewed the RSN Handbook of Embroidery, and followed up with a give-away of a copy, thanks to Lynn Hulse, who contributed the book. Today, I’m happy to announce the winner. 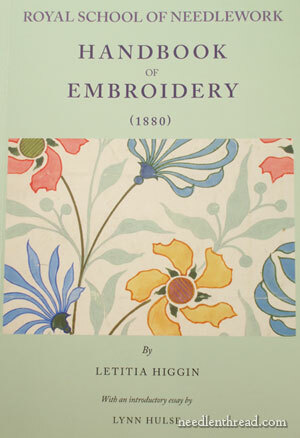 As I mentioned last week, this book is a must-have for the historical needlework buff. Anyone interested in the history of needlework will find the introductory essay by Lynn Hulse a fascinating exposure of the early years of the Royal School of Needlework. And the handbook itself is a little gem for instructional purposes. Incidentally, this year (Queen Elizabeth’s Diamond Jubilee) happens to be the 140th anniversary of the founding of the Royal School of Needlework. The RSN is celebrating their Royal Connections with special exhibition tours in March, May, and July. They’ll also have a special sampler available early this year, marking the Diamond Jubilee. So if you are traveling in that direction, or somewhere nearby already, you might want to look into visiting the RSN during one of their tour weekends this year. You can find more information about visiting the RSN on their website. The winner of the RSN Handbook of Embroidery is Melissa Bird! Congratulations, Melissa! Drop me a line with your mailing address, and I’ll get that in the mail to you this week! If you’re wanting your own copy of the RSN Handbook of Embroidery, you can find it available through the Royal School of Needlework. I don’t know of any booksellers outside the UK carrying it, but if you know, feel free to share the information in the comments section below. And, on a final note, I was delighted to receive a collection of very nice, beautiful embroidery books from a quilting friend recently. I’ve decided to pass them on to you all. Over the next several weeks, I’ll be giving away several very nice embroidery books, so do keep an eye out for them! Congratulations Melissa! And Thank You Mary, for introducing us to such a wonderful book! Thank you and I will treasure this beautiful book. In the last year because of your site I have ventured away from the safe stitches and tried the more involved stitches that you offer on your website. My friends have started to comment on how my technique is more confident and harmonious. This is because of your hard work and informative yet fun site. I’m so pleased for you Melissa. Your comment is the epitome of Mary’s site and I don’t think it could have be put in a more appropriate way. Congratulations. Congratulations on winning Melissa and thank you Mary for your wonderful giveaways and great site at Needlenthread. I have spent this last year looking forward to Mary’s message everyday, I’m never disappointed. I could send all day on this site. This year though I would like to get to know the other people who also love this site. And thank you to everyone else for your well wishes and congratulations. I like that we can reply to each other individually now. This is a really great tool. Even though I feel like a sore loser I will congratulate Melissa gracefully! lol I broke down and bought the book straight from the school although I did see it was being sold in the states on amazon. Very expensive that way! But worth it I believe. Thank you for the lovely intro on this book. Lucy Barter of Forever Embroidery in San Franscisco California is another source for this book. Lucy runs the RSN seminars in the USA. Another happy ‘customer’. Lovely. Look forward to the upcoming book giveaways. I carry the 1880 Handbook at $35. As the course coordinator for the RSN in America, all RSN books as well as other merchandise are available from my shop, by e-mail request. I also have all information on courses and classes held in the US and our satellite venues. In celebration of the events Mary has mentioned we will be holding day classes in San Francisco which can be seen on the RSN website. Mary, I have seen several RSN publications on the Amazon Books webs site. In general, Barnes & Noble can usually order anything still in publication. These are worth a try. Please place me on list for notification of specials, events, etc. Next Next post: Long & Short Stitch Filling: All Filled Up!